Wylaco is one of the Nations largest Klein Dealers! Description: Set contains: 68410, 68411, 68412, 68413, 68414, 68415, and 68416. Includes pouch with marked pockets for each wrench. 1/4" through 5/8" Features: Open ends are offset at standard 15 ° angle for confined working areas. Box ends have 15 ° angle offset to provide clearance over obstructions. Forged from highest quality alloy-steel. C.. 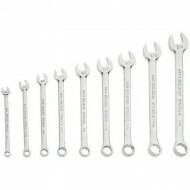 Description: Nine-piece combination wrench set which includes one of each of the following 6-point wrenches: 1/4 in. ; 5/16 in. ; 3/8 in. ; 7/16 in.. And the following 12-point wrenches: 1/2 in. ; 9/16 in. ; 5/8 in. ; 11/16 in. ; 3/4 in. Features: Forged from the highest quality alloy steel Nickel plated Chrome finish is attractive, extra-smooth and corrosion-resistant Box and open ends h.. Features Open ends are offset at standard 15 ° angle for confined working areas. Box ends have 15 ° angle offset to provide clearance over obstructions. Forged from highest quality alloy-steel. Corrosion resistant. Nickel chrome plated. Open-end and box wrenches have the same size opening on each end. Set contains: 68507, 68509, 68510, 68511, 68513, ..
Klein Tools 68404 12-Piece Combination Wrench Set Klein Tools 68404 12-Piece Combination Wrench Set Features: Set contains: 68410, 68411, 68412, 68413, 68414, 68415, 68416, 68417, 68418,64819, 68420, and 68421 Includes pouch with marked pockets for each wrench. Klein Tools 68404 12-Piece Combination Wrench Set Specifications:&nb..